We are excited! We want to show off our new office and talk about our services, so we're hosting an Open House & Ribbon Cutting event! Our goal at this event and getting to know EACH of you so bring lots of business cards, brochures and whatever you may want to bring to hand out to others. Consider this a huge FAMILY get together under one roof and one parking lot! You can't miss this day, it would mean the world to all of us at WinnComm, LLC if you showed up. Please R.S.V.P. with your family if you like! Please do NOT hesitate to invite others! Our affiliate program gives referrers a five percent (5%) commission of actual contract. 1. GRAND PRIZE: $1000 off any new redesign + development of ONE website or mobile app. AND MORE! You'll have to come to find out "the more!" 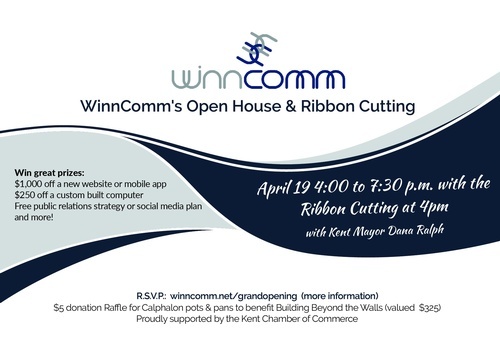 April 19th from 4 p.m. to 5 p.m. - Kent Chamber will be onsite with Ribbon Cutting by Mayor Dana Ralph at 4:30 p.m.